With 60 years of investigation and development we have completely redesigned our system to provide instant capture, safe for the client and very easy to use, supplying maximum benefit of your time plus complete comfort to your client. Our SD System is completely designed to obtain a high quality capture through our patented illumination system; with more than 180,000 fiber optics designed to create close up photography thus obtaining a macro depth of field of the Iris and/or Sclera of the eye. This exclusive illumination system of high intensity cold lighting "captures" with highest resolution the profound detail in each area in question of examination offering protection and comfort to the eyes against the dangerous ultraviolet rays produced by all the flashes used in photography. Finally, our capture system which works with 120 Volts A/C, is light, resistant, durable and can be used in-doors as well as out-doors; it's completely portable, very easy to assemble and disassemble and can be taken with you anywhere you'd like (available in 220 Volts A/C). 1. Storage System: Carrying case designed to supply better protection and easier transportation with an anatomic handle, double latches and security key lock. 2. Focusing Training Device: This device is designed so that through two synthetic (artificial) eyes one blue (clear eye) and one brown (dark eye) be allowed to perfect the capture technique; where it intervenes with the centering of the eye, the focus of the eye. 3. Electric Switch: Through this switch you partially enable and disable the electric energy in the entire system. Non the less, it’s best to mention that your SD counts on a parallel electric supply exclusively for detaining information and various adjustments “Stand By”, this one counts with an luminous amber indicator which indicates its function and protected through an independent fuse-interrupter. 4. Selecting Knob for the Function of the High Velocity Illumination System “FLASH”: This control is designed with the purpose to select the high velocity illumination “FLASH” and that way obtain the perfect capture, the left or right high velocity illumination “FLASH” may be selected with complete independence and/or both, if the user desires obtaining complete control of the high velocity illumination “FLASH”. 5. USB Connection Cable: This cable supplies a high quality digital transmission at a high velocity (this connection is standard in all computer systems. This is the cable that is located in the posterior part of your camera base in a flat rectangular form). 6. Electric Supply Cable: Through this cable your SD is supplied with 115 v. energy installing into the regular 115 v. outlet. 7. Longitudinal Displacing Knob: This knob displaces the capture system to the right and left to allow locating and centering the corresponding eye. It is important to mention that through the focus knob, the level knob and the displacing longitudinal knob the desired capture is obtained, centered and focused. 8. System Protection Fuse: This fuse protects the electric energy supply towards the interior of your SD with the exception of the system for information and various adjustments retaining “Stand By”, which counts with an independent protection. 9. Left and Right Continued Illumination Control Knobs: These controls are designed with the purpose to control the continued illumination and that way obtain the perfect capture, the illumination may be selected through the left or right fiber optic with complete independence and/or both, if the user desires obtaining complete control of the continued illumination. These knobs control the intensity of constant illumination. The SD is designed to adjust the ace of light with complete individuality, conducting this illumination through each fiber optic obtaining a magnificent illumination, adjacent to the outline of the iris and/or sclera, allowing the capture with low illumination intensity obtaining a great image quality along with a comfortable capture, avoiding unnecessary discomfort for the client. 12. 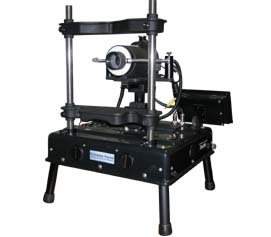 Telescopic Stabilization System: Telescopic Stabilization System:This equipment has been designed so it may be used on its base, which can be rested on a desk or table. It can also be used with its legs completely extended, which due to their telescopic design, can virtually be adjusted to the desired height and position. 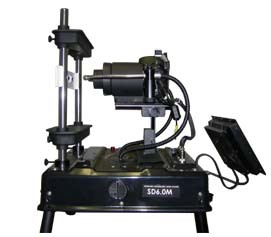 In addition and as a result, our Model SD counts with high stability and compactness. 13. Capture and Transfer of Images Knob: Through this knob in an easy and simple matter you capture the desired images and when you desire to rotate the capture knob towards transfer, the images will be transferred to your computer system. 14. Connection RCA and S-Video: this equipment it’s designed and provided a system for projection, with this connections we can install a monitor or a television set and/or projector and to make presentations with audio and video and being able to record conserving them for you, its client and/or his audience an audio video and file. 15. 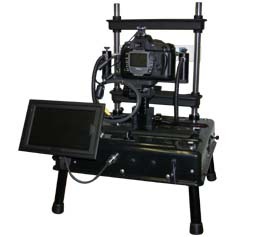 Cooling System: The SD is equipped with a cooling system where externally there are four vents located, two in the front part underneath the head rest and chin rest and the other two are located on the sides in the center of the camera base. In the posterior part of the camera base there is a fan that upon switching on the SD System simultaneously begins its circulating function beginning to cool the internal components and upon switching off the system it stops functioning. This cooling system maintains the correct temperature inside the system prolonging it’s life (it is very important not to block the free access of air to the interior of the system through the four vents as well as allowing the free discharge of air from the interior of the system to the exterior of the camera base through the fan on the posterior part of the base). New Advantages. In all SD models you can capture, view on the built-in monitor and print the image without a computer; and/or you may use a computer to perform a complete iridology report. We accept all mayor credit card, personal checks, direct deposit. Shipping & handling charges depend on the location National USA or International of the shipment, number of packages, dimensions, weight and shipping service desired: Overnite (24 hrs. ), second day, third day, or the normal service 7 days. To calculate the monthly payment of any configuration (products as cameras, charts, books, colon boards), the total package lease price must be divided by 24.56 and the result will give the approximate monthly payment.